Dr. Strangelove is one of my favorite movies of all time. It is dripping with satire and plastered with laugh out loud lines chronicling one of the biggest fears that consumed the people of the country in the 1960s. The fear of nuclear war with the Soviet Union. It seemed like it was going to happen in the 60s. But could something happen by accident? Those concerns were alive when Stanley Kubrick provided the answer with Dr. Strangelove or: How I Learned to Stop Worrying and Love the Bomb. Renegade General Jack D. Ripper (Sterling Hayden) sent out a command from Burpelson Air Force Base that the planes circling the Soviet air space should continue on and drop their bombs on their targets, effectively starting a nuclear war. He did this because he believed that fluoridation of the American water supply was a Soviet plot to poison the American people. Clearly, General Ripper had lost his grip on his sanity. But with the recall code in hi head alone, there appeared to be no way to sto the planes from starting WWIII. United States President Merkin Muffley (Peter Sellers) received the news from General Buck Turgidson (George C. Scott) and the President started desperate measures to try and stop the bombs from being deployed. Dr. Strangelove is an amazing film that shows the absolute best of EYG Hall of Famer Peter Sellers. Sellers not only plays the President of the US, but he also plays Dr. Strangelove, a wheelchair bound scientist from Germany who may have served Hitler, and British Group Captain Lionel Mandrake, who is trying his best to convince General Ripper to give up the recall code. Sellers creates three distinct characters with three distinct personalities. If you did not know already, you could be fooled into thinking that these were three different actors. It was a tremendously epic performance from Peter Sellers. Reports indicated that Sellers was also supposed to play the Major “King” Kong, the leader of the plane that we see, but he did not think he could do the proper accent. Slim Pickens took the role which became one of the greatest of his career, which included the iconic ride on the bomb down to the ground. 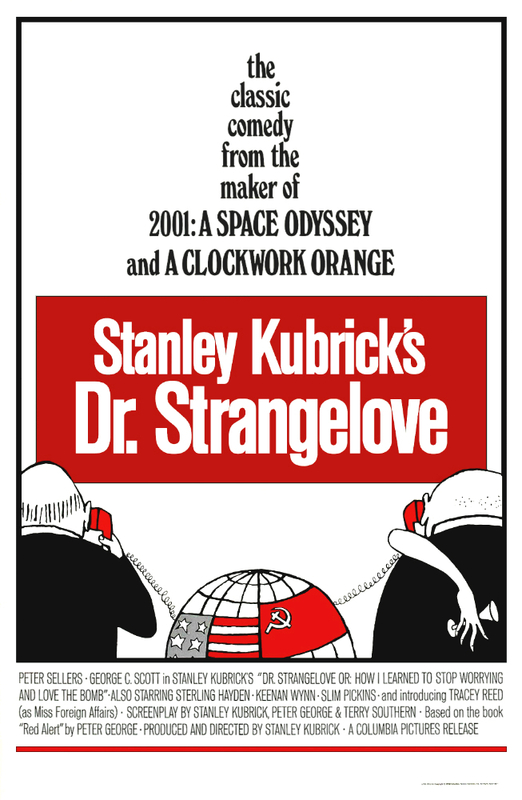 There is nothing off the table for Kubrick’s satire. The idea of the arms race, the conflict between the USA and the USSR, the generals living the high life, the proposition of a President not having any real power at all. These are all topics satirized by Kubrick and brought home by this talented cast. And, SPOILERS since the film ends with the bomb being dropped, you would think that the American public, which was already scared and paranoid at the time, would be even worse after this film’s release. However, that was not the case and an argument could be made that it helped take the sting out of the fear by making fun of it.